It's all about circles for me right now. First off, I kept diligently plodding away making my 9 patch blocks until I had four complete sets. Then, frankly, I just couldn't stand it any more and had to make another circle. Just the one. I'm not stockpiling them, so will only make them when I have a set of 9x9 ready to go. I'm happy with how this is looking, so this is my way of keeping to the task in hand, instead of veering off and making way more circles than I need, just because they are fun to do. I have been thinking about placement too and wondering why I so often start in either the upper or lower left hand corner. Is it because I am left-handed? Or just set in my ways? I have also, more usefully, been thinking about the next step, when I start to put these big blocks together. 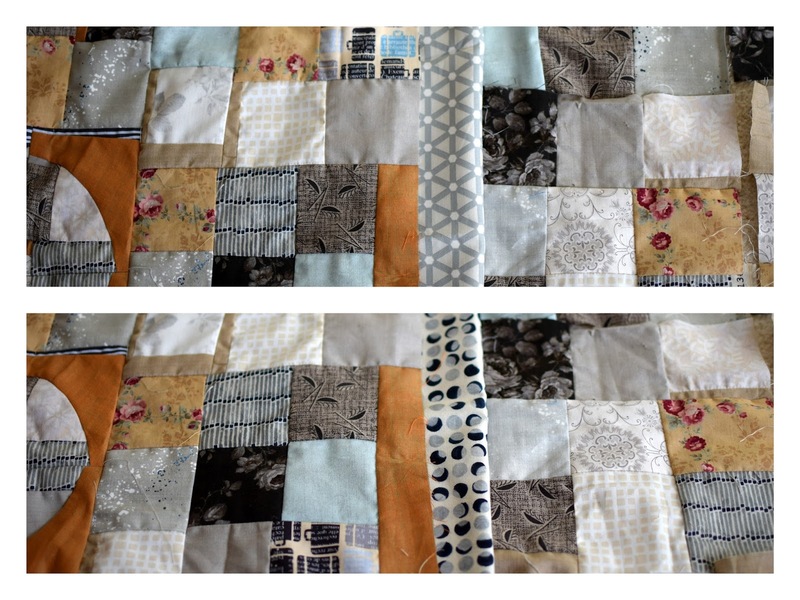 Given that there is quite a marked discrepancy in sizes, I have to think about filling the gaps again - the story of my quilting life. On a different, though still circular note, I am going to join in with the Quilty 365 project just starting at Quilty Folk (button on the sidebar). A circle a day, every day for a year. Now I just need to make some initial choices and get on with it! Wow! This has really grown. I love the four blocks together. I find it really interesting how much visual impact the circles have. I''m enjoying watching your quilt grow. Love the colour scheme, and those fillers will really add to the overall look and to the asymmetrical balance. I like your direction of circles into this very busy squares! Maybe it has something to do with the Rule of Thirds, an art concept having to do with how we naturally see things. I was thinking it had to do with reading, too, but I wonder if there is a difference for people who have a history of learning to read a vertical writing system. Those new filler fabrics look like wonderful possibilities for additions. And the circle project? Oh, goody! It will be like reading a serial if you post those every day. I'd love to do a 365 day thing, but I don't do anything for 365 days. Well, nothing that requires thinking, anyway. I imagine I'd be good for about 5 days, then life would take over and I'd be done with the whole fiasco within 10 days or so...if we count the 4 days of pondering whether I really should try to stick it out! I'm so easily distracted, it's sad, really. Your quilt is really starting to come together. I love the bronze circles. I still think your keeping them to a controlled level is what's working so well. I want more, but that might have too much impact and change the quilt. The sashing you're using as a filler is perfect. The top needs a restful, quiet space to break up the nine-patches and circle motifs. Do keep going. I'm so very curious where this will all lead! Looking at your first photo, is there a way to insert your new fabric and make a sketchy larger circle? A hint of a circle? I don't know but that's what came to mind. Kaja this is looking so good and resolved already. Do you have a finished size in mind or will you just keep going until it feels right/you get fed up with it?! It's interesting how we start isn't it? I think I'm more a start in the middle person and then change it all about as I go! 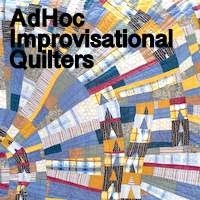 AHIQ - Share your improv #3 and a finish!